Trends define a generation. In contemporary architecture, they create moods for the industry and determine how our personal space will influence our daily lifestyles. Before presenting our 7 current home design trends, it is important that we clarify the difference between a trend and a fad. Often substituted for one another, they actually mean quite opposite things. A trend is something that sticks. It has the potential to stay around for decades in some cases. What confuses many people is that a trend and a fad look similar in the beginning but the difference is that a fad will die. A good way to think of it is that a trend will give direction and a fad is just a craze. At Phil Kean Design Group, we have solidified a custom design style that fuses classic trends with contemporary elements to become our own special brand of interior design and residential architecture. Kitchens are getting bigger—what was once hidden away is now the epicenter of every home. The dining room has begun to fade as seating space is now being included as part of the kitchen. These spacious kitchens provide a central hub within your home for family to gather together in one appealing space. Inside and outside have become one. What used to be a very defined line, or wall, is now blurred. Rooms now blend into the outdoors without worrying about a solid distinction. An indoor/outdoor living space can include anything from a full kitchen, to furniture and TV. 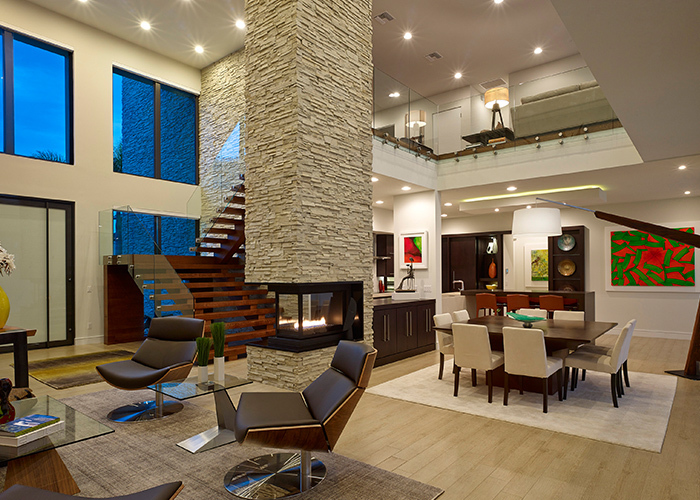 Open concept. Open concept. Open concept. Gone are the days where every room had a door and four walls. Instead of traditional rooms, there are now implied spaces. These spaces connect to each other without obstructions creating minimalistic interior design. This concept can even be applied to multiple floors to create an enlarging effect of the home’s interior space. With asbestos and lead paint causing health problems in homes built in the past, today’s homes are designed to ensure healthier interiors. Using sustainable design and green construction, homes can effectively eliminate harmful fumes and chemicals. Houses are becoming a destination for their owners as they turn away from health clubs and implement their own fitness and relaxation areas into the comfort of their own home. Examples of this are the increasing amount of home gyms, hot tubs, whirlpools, steam rooms, and spa-influenced bathrooms. Tying in with open concept design, homes are including more and more spaces that have less defined purposes. Modern architects are now designing flex rooms with the ability to easily transform into a new area without a complete makeover or costly renovation. Larger windows add beauty to a room by bringing the view of the outdoors in. However, large windows are not just for looks. They can also contribute to a passive home. A passive home, also known as energy efficient, uses large windows with low-e glass to reduce artificial lighting while also obstructing heat and harmful UV rays. Home design trends and fads have been changing for thousands of years and they are sure to continue to change well into the future. One trend that isn’t likely to change is the incorporation of a green mindset with smart home design to achieve sustainable architecture, healthy interiors, and elevated living environments. Be sure to look through our portfolio to see examples of our sustainable designs and how we merge current trends with our signature Phil Kean Style.